NOTE: Click on any pic to enlarge! G3? G2 and a 1/3 if you ask me. All my respect to Robert Fripp for his work with King Crimson but he simply does not belong to a G3 line-up. His "show" was about 20 minutes long and basically he did nothing but sitting on the side of the stage, playing a few chords, twisting the potmeters of his effect gear. For a few seconds it may be fun to listen to but I wouldn't call it a show going on for about 20 minutes. 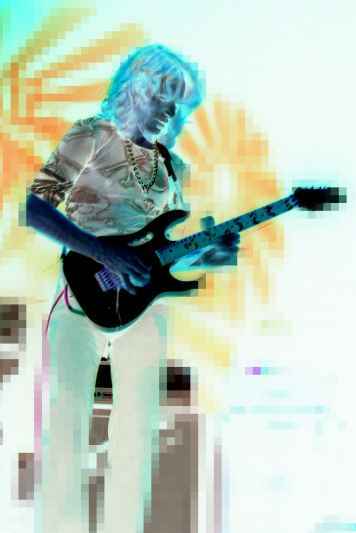 He had no band to back him up, and all alone with just a few chords to support him from another guitar (if I'm not mistaken played by Tony MacAlpine hiding invisibly in the back of the stage); he was unable to grab the attention of the crowd. 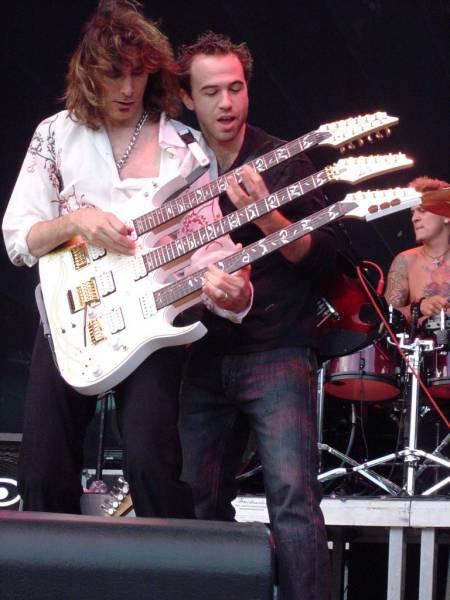 Unlike Steve Vai. Sunday night he proved again what a nice little boy he is. I have never seen so much talent squeezed in one band as the one Steve has put together as his touring band. 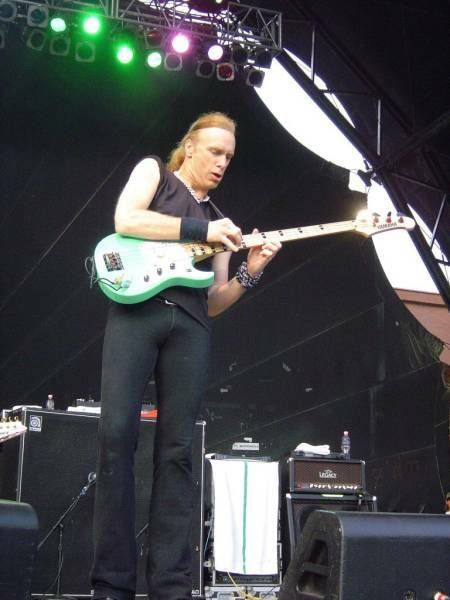 Probably due to their long partnership dating back to the David Lee Roth days Vai managed to get Billy Sheehan on board for the bass, and God-only-knows-how he also recruited Tony MacAlpine to assist him on keys and guitar. [To be frank, having seen the show "assist" is a really bad choice of word but I'll get back to it later.] The rhythm section was completed by Jeremy Colson, a young drummer I had never heard of before. Imagine the energy of the young Tommy Lee, the current number of his tattoos, with a performance as spectacular as Lee in his prime but with the brilliance and complexity of 5 times as much as Lee could ever hope for. 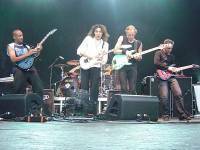 The band was completed with Dave Weiner on rhythm guitar, another young talent I hadn't heard of before. 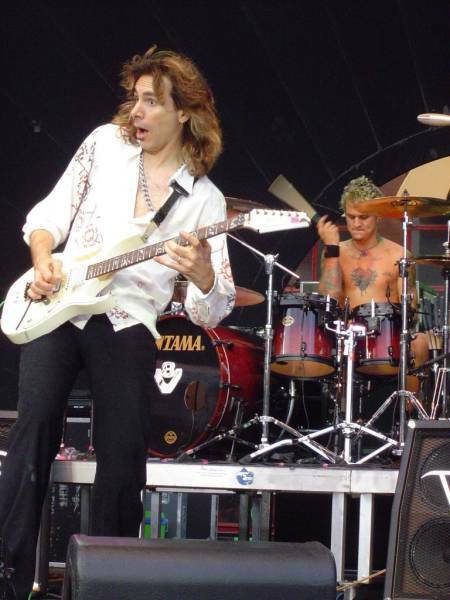 When reading about the line-up of the tour-band I was shocked to see MacAlpine and Sheehan "standing in the line behind Vai's back" but all my anxiety was washed away as soon as the show began. 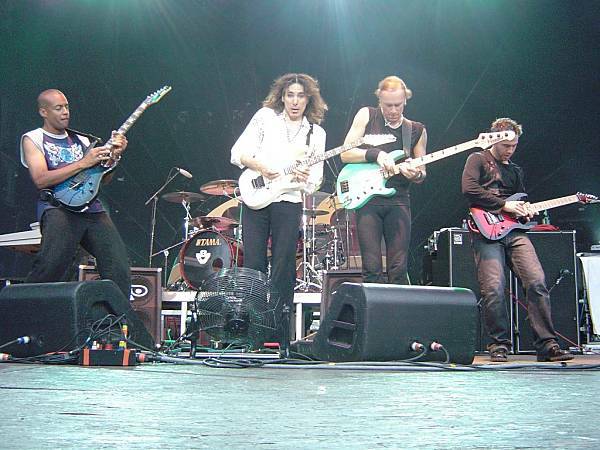 Steve Vai REALLY was a nice little boy, treating his band with respect, giving them equal opportunity to showcase their talent and the band did so. 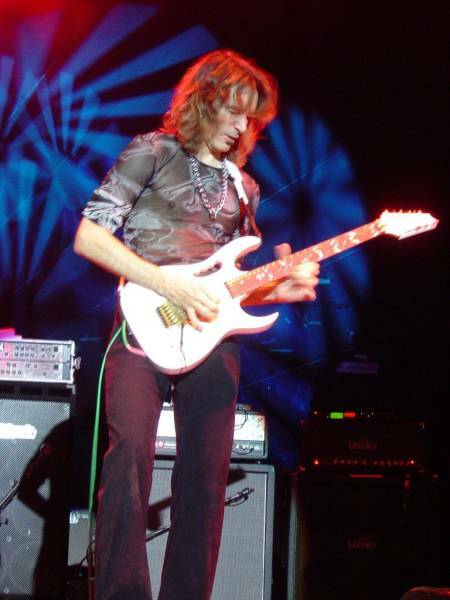 Steve even handed the first line of "For the Love of God" over to Tony to play it on keys (not many guitarists would do that to their biggest hit), and both backing guitarists had numerous chances for short additional solos built in to Vai's own songs and a few of the tunes were altered to let MacAlpine play dual solos with Vai. 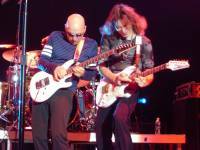 But the highlight of the show was when the four guitarists were standing next to each other playing each other's instruments for a passage of about two minutes, making the relatively cold audience going nuts. I heard a few people talking at the entrance about not buying the pricey (33 euros) tickets but staying in the nearby park listening to the show. I guess they missed a great deal. Vai is a man, not only to be heard but also to be seen. His stage moves are so unique, no words can describe the ease, the professionalism, and the feeling he managed to create there, drawing his full band into the show, making perfect use of their talent and their individual phenomena. Even though Satch put on a great performance after him, Steve and his band clearly stole the show. 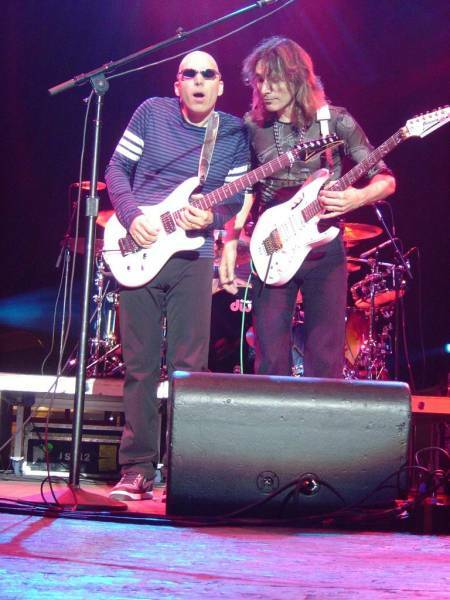 Personally Satriani's music is closer to me than Vai's but Steve's performance (and that of his band) was so impressive that it was impossible to top it. 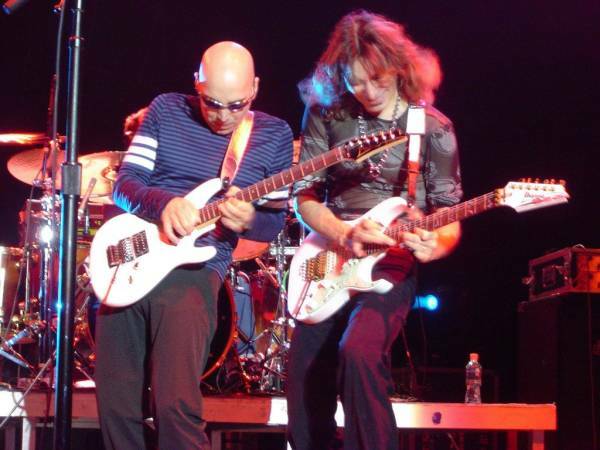 Even though Satch was backed by long-time partners Matt Bisonette and Jeff Campitelli (and sometimes Galen Henson on a second guitar) and they all played super-perfect, the show wasn't as "hot" as Vai's was. 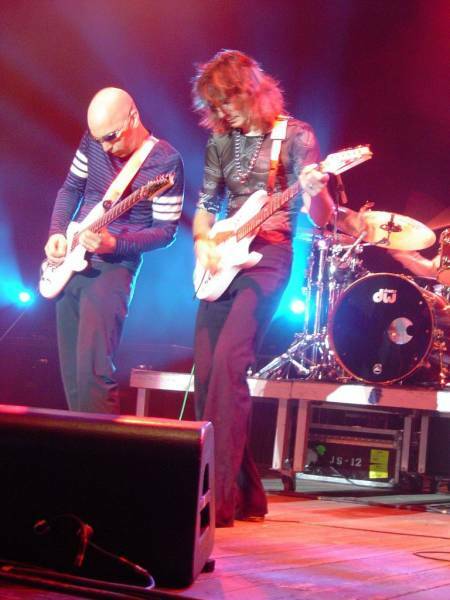 The setlist was impressive, Joe was wise enough to put "Satch Boogie" to second position, included "Always with Me, Always with You" towards the middle of the show, turning the end of it into a great uptempo, improvisative number, and slowing it back to the original theme of the song for the finish. He even included a few of his spacey tunes, and the new "Is There Love in Space". During the last few songs Fripp took his sitting position on the left side of the stage and added a few chords to make the sound thicker, he also contributed to the realization of "Flying in a Blue Dream" that sounded just great live. I guess we all could have done without Satch singing [who couldn't?] and I personally would have loved to hear "Friends" and a bunch of other songs but that's always the case with a setlist, isn't it? The jam session part included "Ice Nine" with Joe and Steve sharing the solos while Robert just sitting in the back of the stage delivering the rhythm guitar parts. 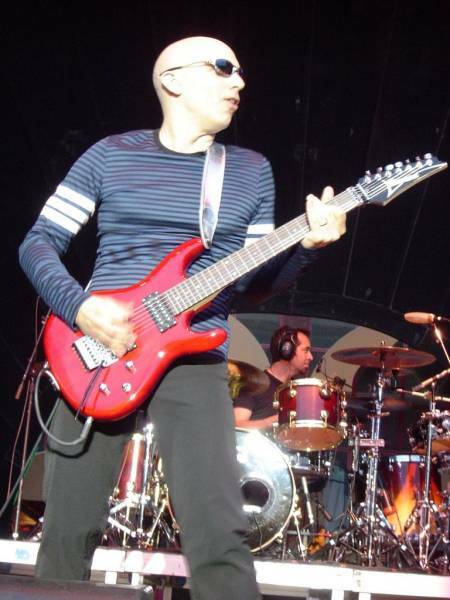 And not even King Crimson's "Red" and his solo passages in the song could make him move to the front part of the stage, dominated by Satch and Vai. Though I can't really appreciate Joe singing, he was still better than Neil Young on "Keep on Rockin' in the Free World" and Vai and Sheehan added thick enough backing vocals to make the refrain explode. Much to my unpleasant surprise there was no encore; roadies took the stage almost faster than the band could get off it. The G3 road show is an experience every guitar lover has to see once. One can only wish the choice for the third party involved would be a wiser one the next time. I guess Tony MacAlpine's inclusion would be more than obvious, and many of my friends in the audience I talked to also shared this wish of mine. Let's hope next year they return with such a line-up to impress us again.